This page summarises data collected since the start in 2003 of regular measurement of cliff loss at all monitoring locations along the coast as conducted by East Riding of Yorkshire Council (ERYC). Also listed are total losses and annual averages for the period from the first Ordnance Survey (carried out 1852 to 1854) to the latest full year. 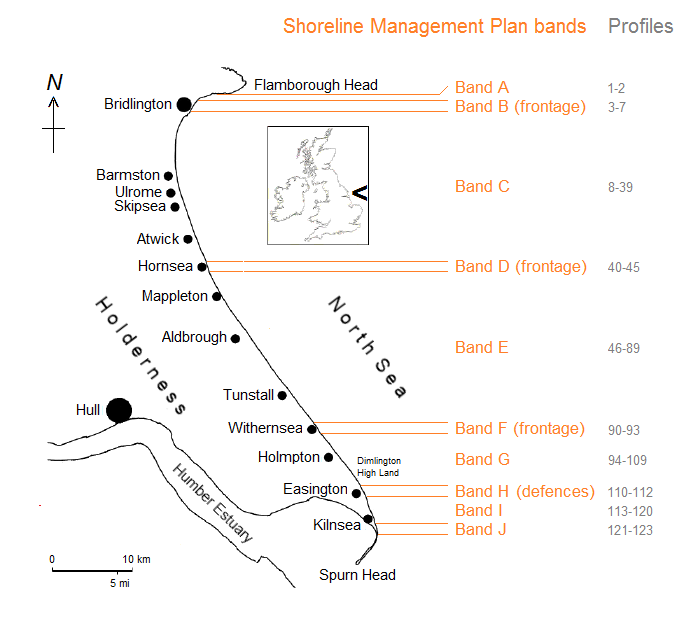 The map shows Shoreline Management Plan (SMP3) bands with corresponding groups of erosion monitoring profiles, maintained by the Council. Cliff recession is monitored along these profiles, which are notional lines spaced at 500 metre intervals (there are three exceptions) along the coastline and which extend from a point a little distance behind the cliff to a position out to sea. Details of locations, intervals between profiles, and cliff heights may be obtained from the coordinates spreadsheet. A background to data collection is available at data in detail. Measurement is usually carried out in autumn and spring in order to capture change over summer and winter. Sometimes it is more convenient for comparative purposes to work in complete years, when each year is deemed to run from spring of one year to spring the following year. Monitoring profiles are presented in numerical order, from north to south, with brief descriptions of locations. Where there are incomplete runs of data since 1854, the total in the final section reflects what is available, and the annual average is calculated accordingly. All measurements are given in metres. An average rate of loss for the entire coastline over the period 2003 to 2017 (15 years) is 1.47 metres per year. Winter accounts for 67.46% of the total losses, and summer 32.54%. Average rates of erosion can mask wide annual variations. The graphic below depicts annual differences over the period of the summary. Prepared by Brian Williams in September 2013. Last data update September 2018.